PamFax is a software application that helps you in sending and receiving faxes without any need to install any additional feature. This tool offers support for a stepwise approach where you are guided throughout the process. This wizard mode allows newbies to learn to setup the dedicated parameters with a minimum of effort. It also provide support for Office and Zimbra toolbar integration along with installing a virtual printer on your computer which allows you to the select the documents you wish to process. This software gives you the ability to select the country from a preset list. You can filter the country by name or prefix along with entering a fax number or name. You can also add multiple contacts, insert the prefix for any phone number that you typed in, select a cover for your intended fax and specify any custom text message. You can upload the documents by either using the built-in browse mode or simple “drag and drop” operation. You can also add items from the computer, any scanned documents or files stored on any online service such as Google Drive, Dropbox, OneDrive etc. This software offers support to a variety of file formats such as PDF, EPS, PS, RTF, WRI, DOC, ODT, PPT, XLS, PUB, TGA, PNG, DWG, and others. By using the SSL protocol for encrypting your sensitive information, this software also allows you to schedule a fax at any given time and date, and even lets you to preview the fax content. Using PamFax Portal, you can access your inbox, sent faxes, history, and trash items, using your web browser. You can also receive notifications via email, Skype and/or SMS, accessing PamFax with Facebook, and embedding your name and fax number in the header of the fax. The interesting thing is that you can start sending faxes from price starting at EUR 0.06 per page. You can pay for faxes via credit card, Paypal or different flexible payment methods. You don’t have to make a minimum monthly purchase or pay for any monthly costs, hidden costs for sending and all you have to pay is for the pages you send. 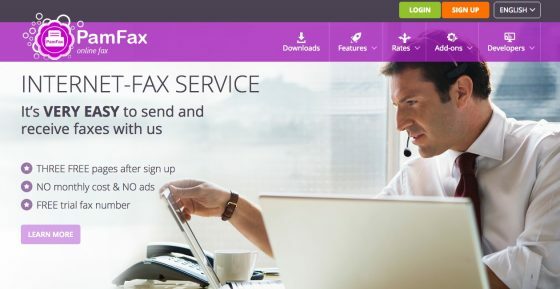 Another great feature of this online fax service is that there is no advertising on faxes. With this, we end our review of PamFax. Try this online fax service for sure and don’t forget to leave your experience and suggestions in the comment box below.